Engineered with accessibility, serviceability and raw power in mind; the Dell Precision T7600 workstation is just what the professional video producer ordered. After collecting feedback from hundreds of professional users, Dell has designed, engineered, and now, unleashed, its new line of Precision workstations. Towering above the rest, with raw power and blazing performance, is the Precision T7600. 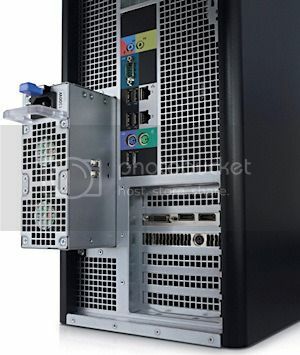 Features such as the industry's only externally removable power supply, quick release, front-accessible hard drives, and Reliable Memory Technology, which monitors and captures errors on dual in-line memory modules (DIMM), in order to exclude bad areas from use on reboot, make the T7600 as innovative and as serviceable as it is powerful. This is one serious piece of hardware designed with serious professionals in mind. A moderately sized case, the T7600 is suitably stout without being overly heavy. A pair of Mac Pro-esque handles makes lifting and moving a simple task. Accessibility and serviceability are key here. Pull a single recessed lever on the side of the case and the entire side tilts out and lifts off with the greatest of ease. The interior is delightfully devoid of the usual tangle of cables and wiring. Instead, wires are bundled together, tucked and snaked, up and over, around and under, various components, to keep them both functional and unobtrusive. It is an extremely efficient design, providing a maximum of unobstructed airflow. Air passes through the case via a stylish, extruded diamond patterned, front panel. One 4-inch and two 3-inch whisper-quiet forward mounted fans handle case cooling duties. Additionally, each of the two CPUs has its own fan pulling air through about a 3-inch stack of cooling fins. A pair of smaller fans built into the power supply, with an additional fan hiding behind the motherboard, provides plenty of added cooling to keep everything running as smoothly, and as cool as possible. Hard drive removal is a breeze with the T7600. The front panel unlatches and lifts out of the way to reveal space for as many as four cold-swap 3.5-inch or eight 2.5-inch hard drives. If your workflow requires you to swap out hard drives for archiving or security purposes you will enjoy the ease of access and the quick release hard drive caddies. Slotted bays make installation and removal quite easy. Worried about drive security? A locking mechanism inside the case prevents the access panel from being opened, keeping your drives - and your data - right where they belong. The T7600's ease-of-service theme even carries over to its 1300-watt power supply, calling it the industry's only mainstream tower workstation with an externally accessible tool-less power supply. 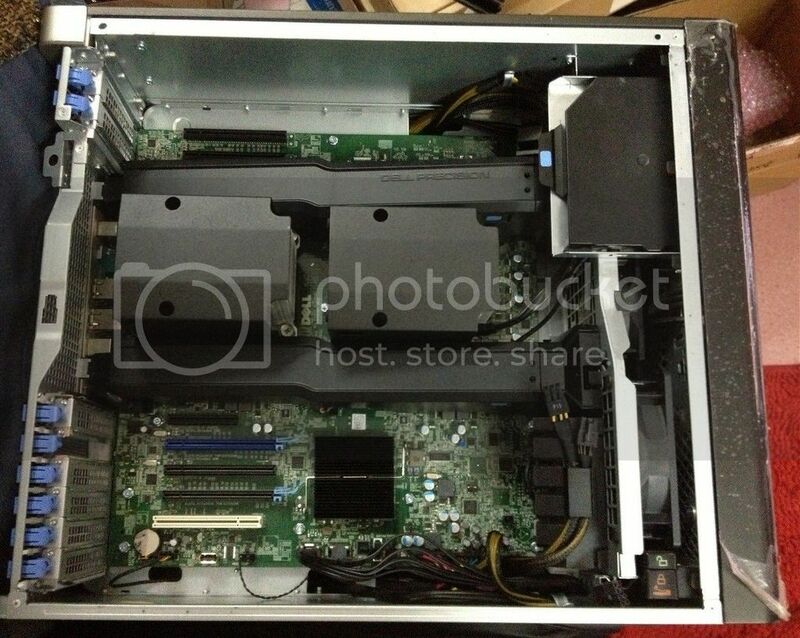 Depress a thumb latch, pull, and the power supply slides right out of the case, slick as can be. Slide it back in until it seats and you're in business. For an added touch of coolness, the translucent handle lights up green to indicate that the power supply is functioning correctly, making troubleshooting a much easier task in the process. Outfitted with two Intel Xeon E5-2687W processors - each with eight cores - 8GB of four channel RAM (and if your pockets are deep enough, this baby can be configured with up to 512GB!) and an NVIDIA Quadro 6000 graphics card with Tesla GPU, we certainly expected impressive performance from our review model. The Windows Experience Index turned in a surprising score of 5.9, though, much lower than anticipated. This result, however, was due to the primary hard disk, a Western Digital Caviar Blue, 500GB, 7200 RPM, SATA drive that scored a 5.9. Swapping it out for a faster drive - say an SSD drive - would undoubtedly bump the score considerably higher. The lowest sub score determines the Index, highlighting the system's primary performance bottleneck. The highest possible score is 7.9 and the other components; Processor, RAM, Graphics and Gaming Graphics each turned in 7.8s. Benchmark tests turned up no surprises and showed the T7600 to be as powerful a beast as one would expect. A check of the hard drives' performance using CrystalDiskMark turned in a very impressive, average write speed of 207MB/s with an average read speed of 209MB/s. An average-ish hard drive will turn in numbers around 100MB/s for both speeds. SPECviewperf 11 tests logged equally impressive results, with each of the viewsets scoring among the highest of submitted results. Not a big surprise, and considering the NVIDIA Quadro 6000 graphics card, this system will have no difficulty handling whatever graphics-intensive applications that are thrown at it. A healthy Adobe Premiere Pro workout, complete with stacks of HD footage, color corrections,keyframing and other effects proved this to be a very video editor-friendly system, indeed. Burn Rubber or Sputter and Die? If you're the type that prefers a muscle car to a moped then you're going to want to get your hands on one of these - provided you can handle the number after the dollar sign. If you're looking to just cruise around in the slow lane, with applications that are neither processor intensive nor have get-it-done-yesterday timelines, then you'll want to just wave this one by. On the other hand, if you feel the need-for-speed then the Dell Precision T7600 may be just the machine for you. Storage: Western Digital Caviar Blue 500GB (2), 7200 RPM, SATA drives installed; bay space for four 3.5-inch or eight 2.5-inch internal SATA or SAS hard drives. Additional add-in controller required to reach 6.0Gb/s speeds for drives that are 6.0Gb/s capable.